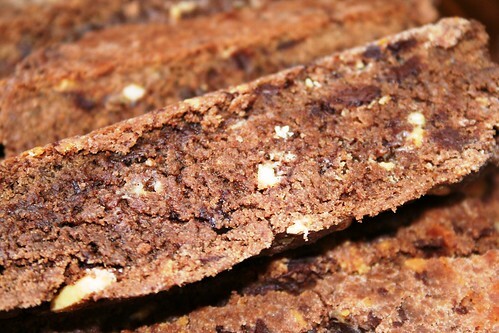 Double Chocolate Chunk Biscotti, originally uploaded by All Things Mimi. This recipe came out of "Better Homes and Gardens" magazine back in the early 90's. I made these and put them in my Christmas baskets whatever year this issue came out. I haven't made this recipe since then. Not because it didn't turn out, but because (like all my other recipes) it got buried under an ever deepening pile of other recipes I wanted to try.